Our Life Partners program significantly impacts our ability to expand and sustain our mission to provide unparalleled, lifesaving care. Life Partners contribute through recurring monthly donations. 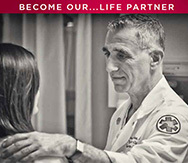 When you become a Life Partner, you will be honored and recognized on our website, and your name will be displayed in the Shock Trauma Critical Care Tower. You will become part of a growing list of partners who help advance the mission and support the lifesaving work of the R Adams Cowley Shock Trauma Center. In Honor of Ralph Marbury Stamp, Jr.
As of February 7, 2019.